Battling apathy requires determination and effort … and the reason it is vital to battle apathy? Because evil thrives when good people say and do nothing. What I love about having a much higher “Respect Level” AND Faith in God is how freeing it is to be completely honest about everything … regardless of whether other people believe they are hearing the whole truth or not … because frankly, in my experience and for many other people, such a level of honesty and truth is not the regular experience … but I sure am glad it’s mine now … and I also won’t accept anything less in my personal and business relationships … cause life’s too short to waste precious time on anything less once you get this. On that note, to keep the people updated who want payback from the money I ended up borrowing because I didn’t have the funds to pay for my own place when I moved to Kincardine, plus support me while not working because of having to be on call 24 hours a day for Dad when he lived in the retirement home, two long-term care homes, and then the Owen Sound hospital before his death over three plus years, since I haven’t been able to secure income in traditional jobs, I am blessed with another option I am avidly pursuing. Not bankruptcy or even consolidation because I am confident by this time next year, I won’t be giving any of you any more of my time or thought because all of you will be repaid … as I have told you and promised repeatedly in my letters sent to you as my circumstances have changed during these past years. As for the option I am pursing, in the past year alone, I have been inspired by interest secured from three community futures development organizations for my company. And though I did not receive funding for my company’s business plan because I don’t have any cash/leverage to commit, only intellectual capital, I am pursuing other legal, non-credit based options that will kickstart the company and debt repayment. And as for those who have been legally right to try and collect dollars, but have been one of the most disrespectful connections I have ever had to deal with in my life, I assure you your story will be told to the public and I will work with the government to curtail the allowance of baiting people with unsecured credit and then sending in the sharks to attack verbally and in any way they can “legally” get away with. Now that is what high “Respect Level” honesty and truth looks like folks. God, what a relief it is to be completely honest and faith-filled! New! Weekly Words Starts This Week! Cognitive Dissonance: An emotional state set up when two simultaneously held attitudes or cognitions are inconsistent or when there is a conflict between belief and overt behavior. The resolution of the conflict is assumed to serve as a basis attitude change in that belief patterns are generally modified so as to be consistent with behavior. Check out the new pages and their cool content! Also watch for the upcoming StartSomeGood campaign for the production and filming of the play, Charles’ Choice, and the DVD, for schools, without the need of or resources of drama clubs or local theatres, to present to their schools and communities in order to introduce educate, entertain, and inspire with the Connecting The Dots With The Respect Principle. Have an organization that operates with a high level of integrity? 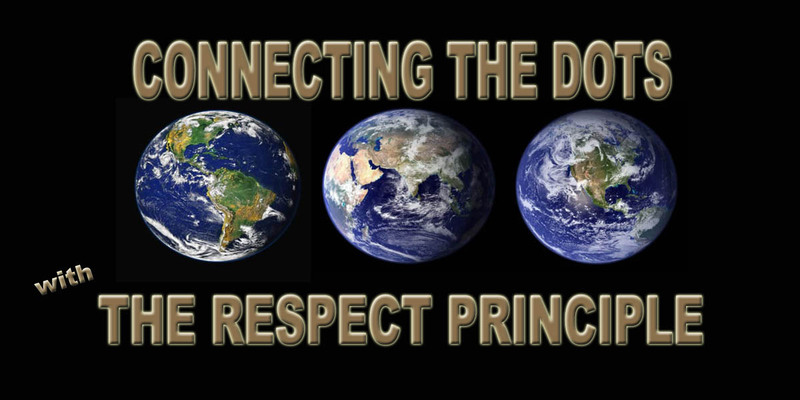 Come and be a part of the 9/11/2017 release for the global launch of the for-profit social business venture whose premise is respect for all … because everyone matters. To counter all acts of tyranny and terror that people with low Respect Levels do to other people, the social business venture, Connecting The Dots With The Respect Principle, will present a fresh perspective to all such limiting, debilitating, and selfish beliefs, thoughts, and acts that attempt to diminish and distinguish human lives … and humanity. Stay tuned world for the good news 9/11/2017!